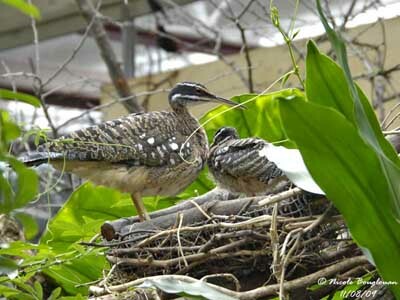 Sunbittern is the only member of the family Eurypygidae. It is a wonderful bird, mid-rail mid- heron, which performs spectacular displays. We can find three subspecies: E.h. major, E.h. meridionalis, and E.h. helias. They differ on upperparts’ pattern. Sunbittern utters high, penetrating whistle “wuuuuuuuu”, often repeated twice. Alarm call is a loud “kak,kak,kak,kak” of several notes. When the bird is disturbed, it gives high-pitched, thin trill. Sunbittern is mainly vocal at dawn and dusk. 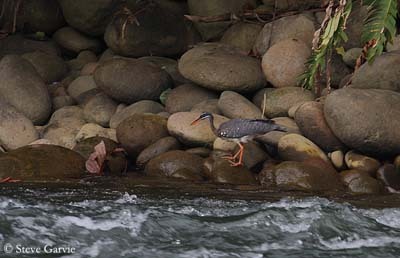 Sunbittern frequents the shores of shady streams and small wooded pools. It is also found in dense second growth thickets, near water. It can be seen from sea-level up to 1800 metres of elevation. 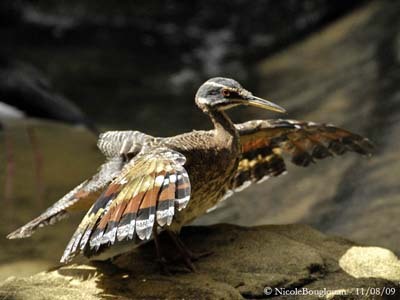 Sunbittern lives in the tropical regions of the Americas, from Guatemala to the Pantanal of southern Brazil and Paraguay. 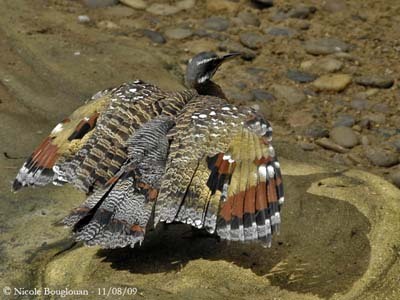 Sunbittern also uses the “broken-wing” display for distraction. For that, the bird ruffles its back feathers, while an open wing is dragged on the ground. This behaviour is accompanied by hisses or rattles. 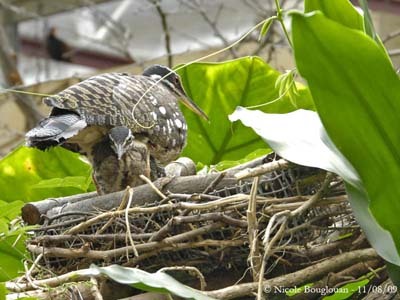 At nest, both adults perform other display as bittern-like facing, with fluffed plumage, body-swaying, forwards bill darting and treading. Before the breeding started, Sunbittern frequently performs flight displays above the tops of the gallery forest trees, at about 10 to 15 metres above. During these flights, they give their “kak,kak,kak,kak”, while they glide downwards with open wings hanging from the body, displaying the beautiful pattern. Several other displays are made at nest-site by both mates, accompanied by duetted rattles. Sunbittern is sedentary in its range, performing only short movements to permanent wetlands. 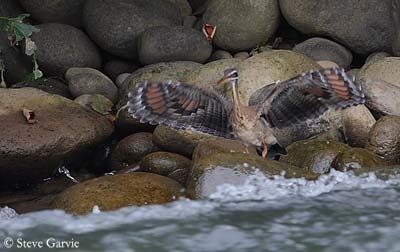 unbittern flies low above water with rapid wing beats and long glides with its broad rounded wings. Sunbitterns’ populations are not threatened. This species can be common to uncommon or rare, according to the locality or the country. 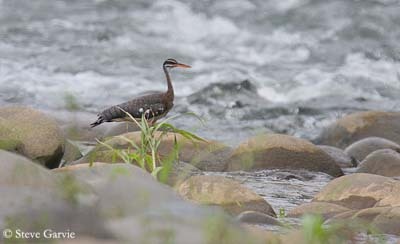 Sunbittern depends on forest with water, and it is sensitive to the changes or destruction in its habitat. It has some predators such as monkeys for the eggs, and raptors which harass the incubating adult. But the “frontal display” is always used and often successful. This species lives and breeds well in captivity and can become tame. When wings are completely opened, this pattern is similar to two large eyes, and plays an important role during courtship or defensive displays. The long grey tail shows two black bands with chestnut edges, very conspicuous when the tail is fanned, adding its pattern to that of the wings in displays. On the underparts, throat and vent are white, belly is pale buff, breast is brown, all with spots, streaks and vermiculated black and grey. Adult male has cryptic plumage, with grey upperparts vermiculated brown, black and paler grey. 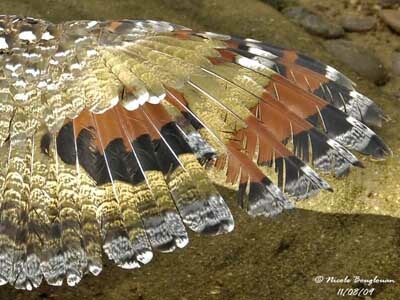 The rounded wings show spectacular pattern when fanned. Upperwing is grey, with two large, semi-circular chestnut patches with black and white edges. These patches are placed within a vermiculated area of yellowish and grey. 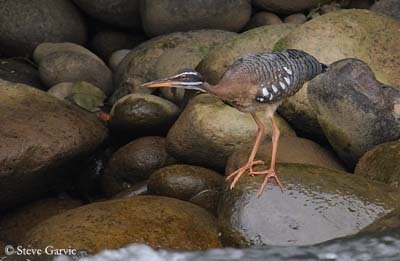 Sunbittern has long, buffy-brown heron-like neck, vermiculated with black and grey. Head is blackish. We can see two white lines, one from lores to ear-coverts, crossing above they eyes, and the other, broader, from the lower base of the bill to the head-sides, as malar stripes. Chin is white. Long, straight bill is two-tones, with black upper mandible, and orange-yellow lower mandible. Eyes are red. Legs and feet are orange-yellow. Both sexes are similar, with only small differences in head and throat patterns. Female can be paler than male. Juvenile is similar to adults, with yellowish eyes. Sunbittern feeds mainly in shallow water, searching for invertebrates and vertebrates, insects, molluscs, crustaceans, but also fish, amphibians and lizards. It hunts as a heron, stalking preys with head and neck held back, and then, with a quick forwards peak, it jabs the prey. It forages as well on land as in shallow water. It walks silently and slowly along the shores and on the ground. 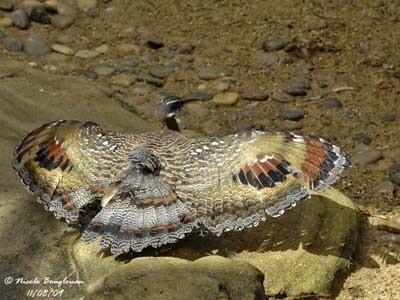 Sunbittern performs spectacular displays, with help of the wonderful pattern of wings and tail. In display, wings and tail are completely fanned and turned towards the intruder, as two large intimidating eyes. This display is mainly used as defence and can last about one minute. Breeding season occurs at the beginning of rainfalls, and starts in March or May, according to the location. Nest is situated in trees close to water. It is built on small branches under the dense canopy. The foundations are made with long grass fibres (20 to 25 cm), in oval shape, and anchored to the support with mud. The bird uses the leaves of the tree which shelters its nest. The cup is lined, or not, with leaves and mud. Female usually lays one or two pinkish-buff eggs with purplish spots. Incubation lasts about one month, shared by both parents. At hatching, the chicks are covered with creamy-white down with black marks on head, neck and back. Both adults brood, feed and care them. They fledge about 22 to 30 days after hatching. Young begin to perform some defensive displays as adults when still at nest. They depend on parents for food for two months or more after fledging. This species usually produces one brood per season, sometimes two is the first is failed. Sunbittern feeds mainly on vertebrates and invertebrates such as spiders, flies, dragonflies, beetles, larvae, crabs, snails and earthworms. But is also takes fish, amphibians, eels and lizards. It forages as into shallow water or on land.